A comforting, cheesy casserole ready in under 30 minutes? That’s right, this cheesy broccoli chicken casserole isn’t just quick and easy — it comes with nutrient-dense veggies and plenty of protein to keep you feeling full for hours. The best thing about casseroles is how simple they are to make — with very little clean up. This dish is no different, and will likely provide you and your family with some hefty leftovers. Casseroles are the ultimate comfort food and the perfect meal option for those who find themselves constantly on the go and scrambling to get a healthy dinner on the table at the end of the day. Use it as your main dish or a side dish that the whole family will love. This one-pan casserole dish is also a wonderful way for you to get a big serving of micronutrients and keto-friendly vegetables. Unlike traditional casseroles that use rice as a filler, this chicken broccoli casserole uses riced cauliflower to provide the texture and mouthfeel you crave. That’s excellent news because even a half a cup of rice packs an entire day’s worth of carbs — about 22g. More than a half a cup of rice will definitely kick you out of ketosis and send your blood sugar levels on a rollercoaster ride. In addition to the cauliflower, you’ll also get a hefty serving of broccoli, which is packed with micronutrients and compounds that support brain health and a healthy gut. That’s double the cruciferous vegetables in one broccoli casserole. Read on for even more health benefits from this healthy, gluten-free dish. Get your daily value of nutrients from real, whole foods for better brain health — especially as you age. Cruciferous veggies like cauliflower and broccoli are rich in phytonutrients — plant-based compounds that may have neuroprotective benefits. Sulforaphane, found in high amounts in broccoli, Brussel sprouts, and other cruciferous veggies, are linked with better brain health. In one animal model, sulforaphane reduced the amount of brain damage and brain edema in rats post-stroke[*]. Sulforaphane may also protect neurons from oxidative stress and toxins[*]. Broccoli is also a great source of dietary folate, choline, and vitamin K — all of which have ties to better brain function and protection against age-related degenerative [*][*][*]. This keto spin on an American casserole will also help your liver do its job. Cruciferous veggies contain sulfur-rich compounbds that are linked with a laundry list of health benefits. But they’re best known for helping your liver detox. Cruciferous veggies contain a compound called glucosinolate, which helps your liver’s natural detoxification pathways. Your liver works hard 24-7 to filter and excrete toxins and excess hormones and medications. Glucosinolate and other nutrients like chlorophyll (also found in broccoli and other green, leafy vegetables) aid in this process. Broccoli and cauliflower are also high in dietary fiber. And fiber is an essential nutrient if you’re interested in gut health, gut microbial diversity, and losing or maintaining a healthy weight. And although fiber is great for you, you don’t need to get it from whole grains as the USDA Food Pyramid suggests. Vegetables like broccoli have plenty of dietary fiber, plus they’re low in net carbs and offer other phytochemicals that help with things like liver detox and scavenging harmful free radicals from your system. Most cheesy broccoli chicken casseroles have tons of unnecessary carbs from canned cream of chicken soups, white rice, brown rice, and breadcrumbs. You don’t have to use pre-packaged food like soup mixtures and stuffing mix to make a family favorite. With this cheesy chicken casserole, you get all the flavor with none of the carbs or questionable ingredients. Even picky eaters will love this cheesy goodness. They may not even realize how many vegetables are packed into this dish. Have a healthy, low-carb dinner on the table in 30 minutes or less any night of the week with this super simple recipe. And save even more time on a busy night by using a store-bought a rotisserie chicken and pre-washed packaged broccoli florets. 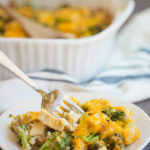 Transform tender chicken breast, broccoli, cauliflower, and creamy cheese into a satisfying keto broccoli chicken casserole. Skip the long cook time and clean up with this one-pan recipe everyone in your family will love. Add mayonnaise, egg, spices, salt, and pepper to a large bowl and mix until smooth. Stir in cheddar cheese, chicken, broccoli and riced cauliflower. Toss well until all the ingredients are well-coated. Transfer to your baking dish. Bake for 25 minutes until the top is golden brown. Add a dollop of full-fat, organic sour cream for an extra pop of flavor. I plan to make this. Sounds yummy. However, to get the nutrition listed, this make 12 servings, not 6-8!!!!!!!!!!!!! I entered ingredients on Cronometer. Serving size about 1 cup. Easy and delicious! A good meal prep for the week. This recipe sounds wonderful; it will be on our table tonight for supper. P.S. I love your chemistry lesson!